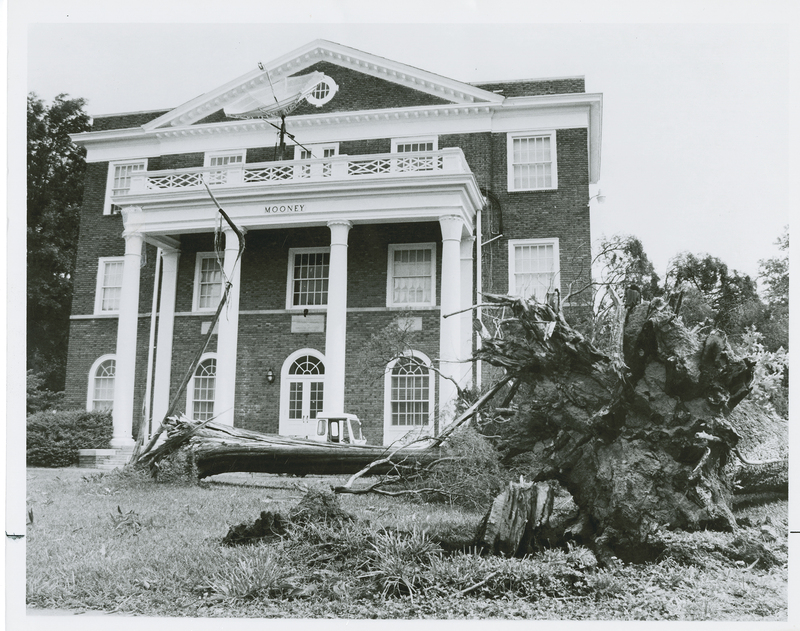 As thunderstorms pass through Alamance County and the Elon area this summer, let’s take a look back at a fierce storm that damaged a large part of campus in June of 1989. Around 7:15pm on June 16, 1989 a tornado-like storm touched down on Elon’s campus, causing havoc and damage to the grounds and buildings. There was over $150,000 worth in damages, power outages, and numerous trees were uprooted. The summer of 1989 had already included a lot of rain fall, and in June the Elon area experienced numerous tornado warnings and watches. The tornado-like storm that struck campus came without much warning and lasted for about 15 minutes, with about 50-70 mile per hour wind gusts. Some of the buildings that were damaged included Beck Pool, Mooney and Duke buildings, and the Adams House which was the home for ROTC. Part of the roof of Beck Pool was ripped off and it was noted that “observers could actually see the sky while standing inside the building” (The Pendulum, August 31, 1989). Additionally, the roofs of Mooney and Duke buildings suffered damage in which the slate tiles were impaled. The Adams House (ROTC) was the victim to several trees crashing on the roof. 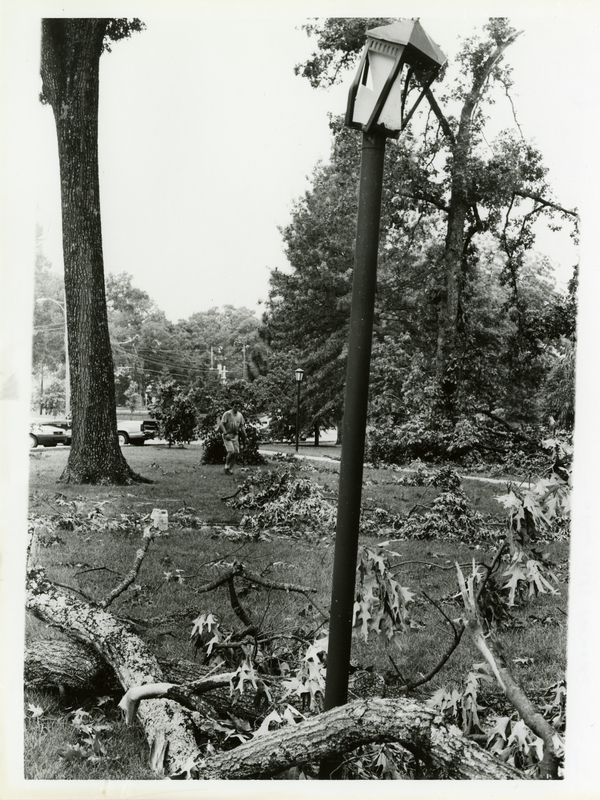 All across campus there were other signs of damage, such as bent light posts, broken glass, and much more. The grounds outside Mooney building, June 1989. The morning after the storm, crews from physical plant began working across campus to assess the damages and started the initial steps to clean up campus. The clean up was a massive undertaking, but the first phase of it was finished by June 20. Luckily, no one was injured during this storm! The things that could not be repaired were all the fallen oak trees on campus–some that were here when the school was established, and many in the memories of Elon alumni. Over 200 trees fell on campus, and about 50 of them were Elon’s precious oaks. Even though they could not be “repaired,” Elon has made a tremendous effort over the years in planting many more trees on campus for future generations to enjoy. This entry was posted in Campus buildings, General Elon History, Miscellaneous Events. Bookmark the permalink.